Ryan Dungey had to pass the new holeshot artist Andrew Short to take the win. Short, who has dealt with food poisoning and missed flights the last two weeks, said he finally feels stronger. “I feel like I shouldn’t complain, but obviously my body was hurting,” he said. Short definitely looked stronger tonight, holding onto sixth after another great start. 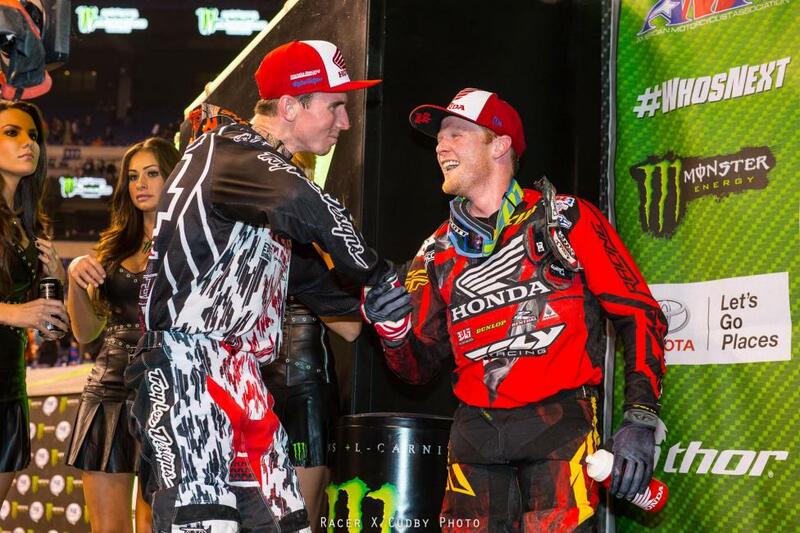 For the second straight week, the start hindered any type of run at a win for Trey Canard. He rounded the first lap eleventh, but was further back off the start. He did work his way up to third—his seventh podium of the year—but Canard wants to win and a start would go a long way in helping that cause. 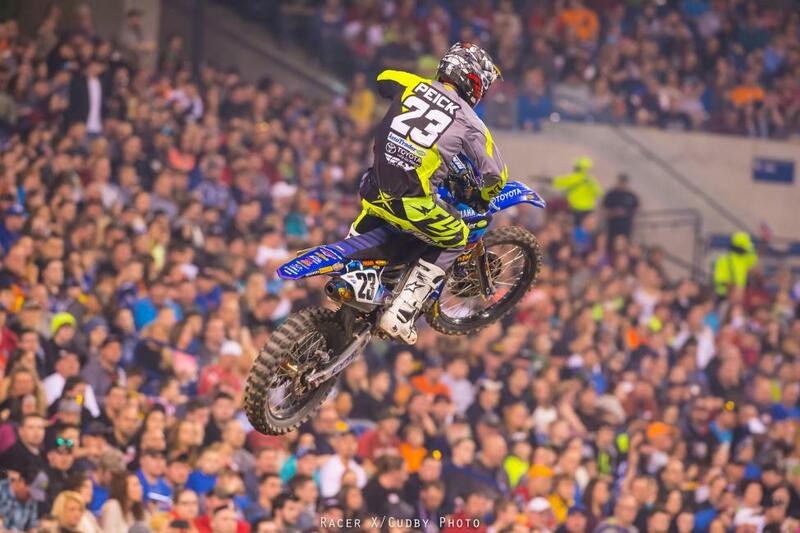 Weston Peick continued his recent trend of running up front. Peick is finally able to train again and it showed as he powered to fourth—tying a season high. “I think in a couple weeks I’ll be a lot better,” he said post race. “Running into Daytona last week, it’s a tough track. Obviously coming back after a few weeks on the bike it wore my out quite a bit so my week was lighter than usual.” Keep an eye out on what may lie ahead for Peick. 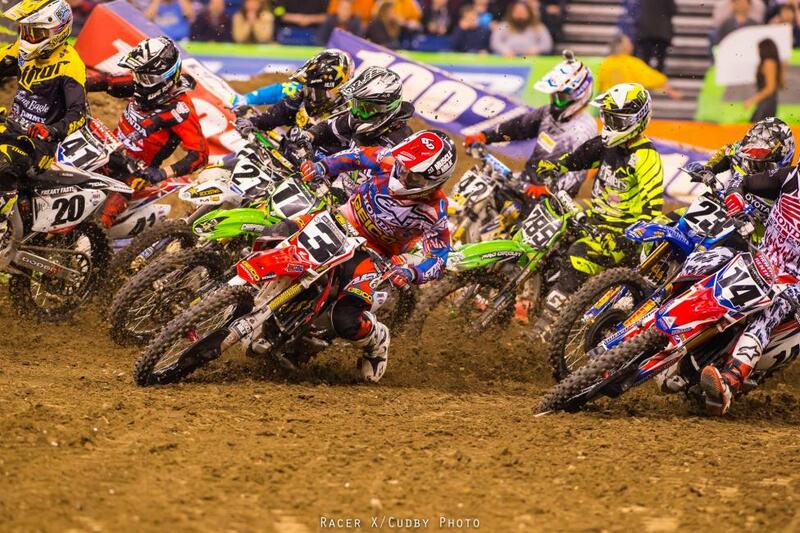 Tough night for Eli Tomac. He had podium speed, but went down after the wall jump following the finish and was only able to work back to eleventh. Josh Grant’s recent top ten trend continued in Indy. Grant, who started the season slow, now has four top tens in the last five races and told us post race he’s happy to get through the west coast rounds healthy and feels like he can continue to pick it up. His seventh was his second best finish of the season. 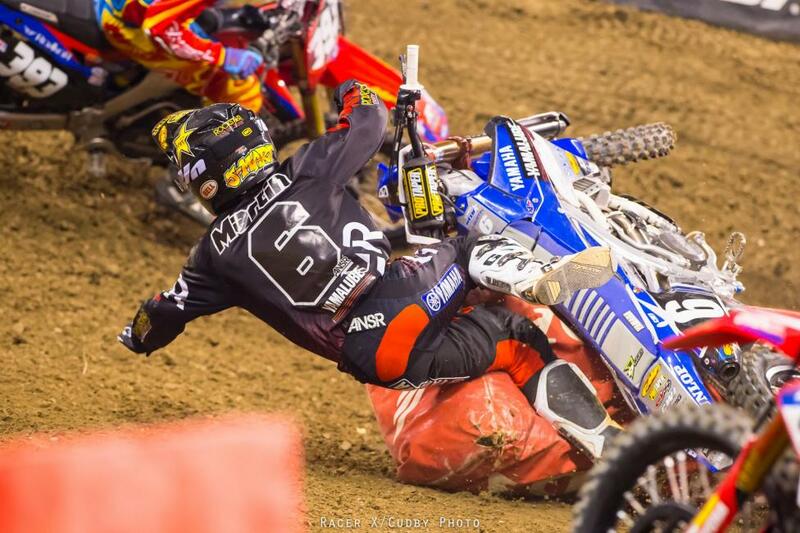 Jason Anderson’s top ten streak has finally come to an end. After ten top tens to start the season, Anderson struggled in the main—crashing twice—and was only able to get back to seventeenth. In 250’s, Marvin Musquin looks unstoppable. He cruised to his third straight victory in Indy and now has four wins in the last five. 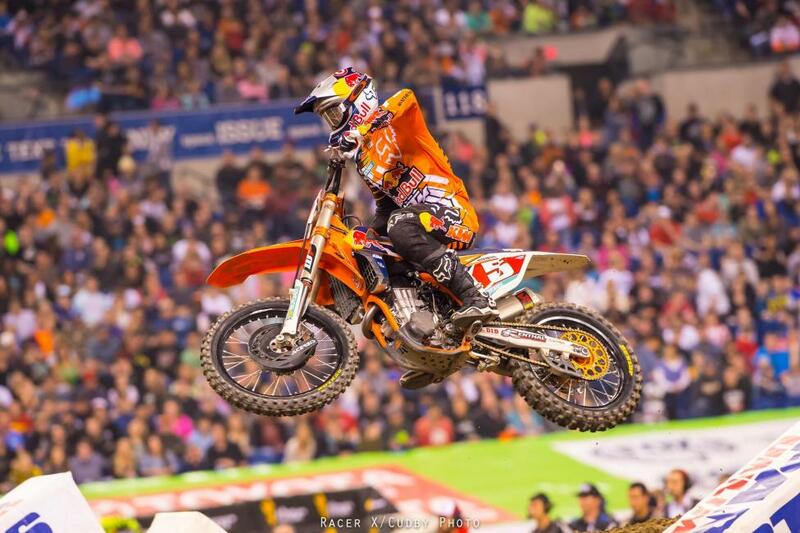 “My bike was flawless tonight,” stated Musquin. “I am very excited to get a win here and stretch my point lead. 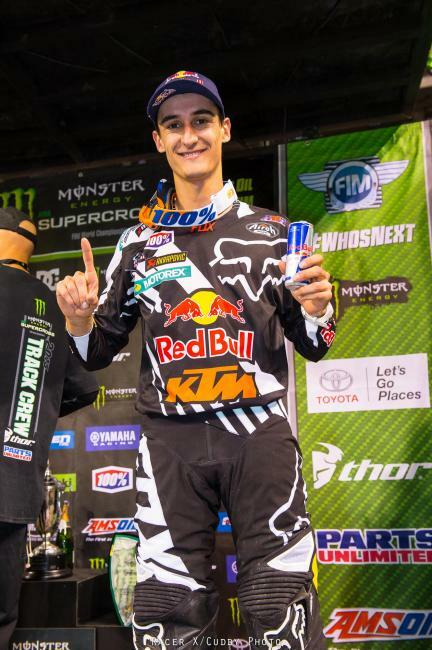 I haven’t lost the red plate yet and I am excited to keep it heading to the next round.” Musquin now holds a sixteen point lead over Justin Bogle. Bogle was good again Saturday, and held tight to Musquin early in the race. But it was small mistakes that was his undoing. Bogle has five straight podiums to begin the year but is losing ground in points to the red hot Musquin. The book has probably closed on Jeremy Martin’s championship hopes. For the fourth time in his three year career Martin failed to make the main event. In his heat, Martin worked his way up to tenth on the final lap but Taylor Potter didn’t give in and Martin ended up on the ground. The LCQ wasn’t much better. Martin actually lead the LCQ before a red flag was pulled. On the restart, Martin got a terrible start but worked his way to around sixth before falling in the whoops. Banner night for the GEICO Honda rookie duo of RJ Hampshire and Jordon Smith. 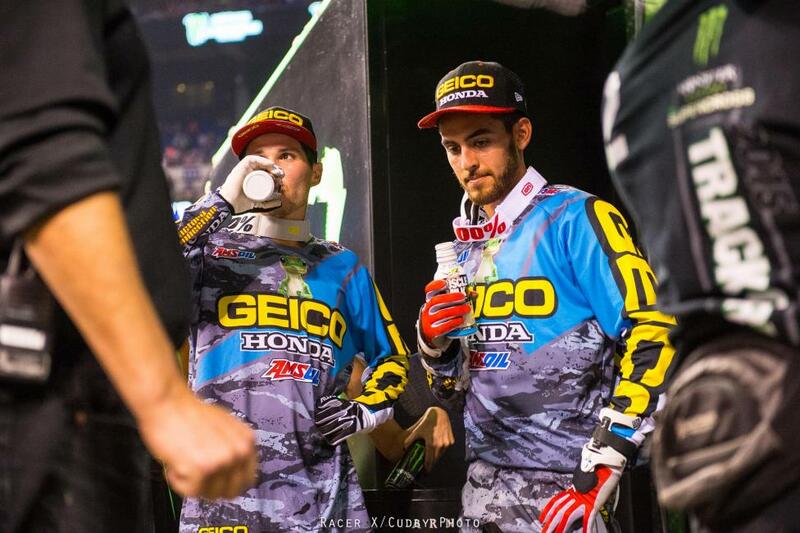 Hampshire rode to his first career podium, while Smith followed in fourth—a career high—to give GEICO a 2-3-4 finish. "I came into the season with the goal of making every Main Event, so to be on the podium is a great accomplishment," said Hampshire. Tough break for Joey Savatgy who was in third early in the race before what appeared to be a mechanical problem led to a DNF. With his twenith place finish, Savatgy lost third in points to Hampshire.